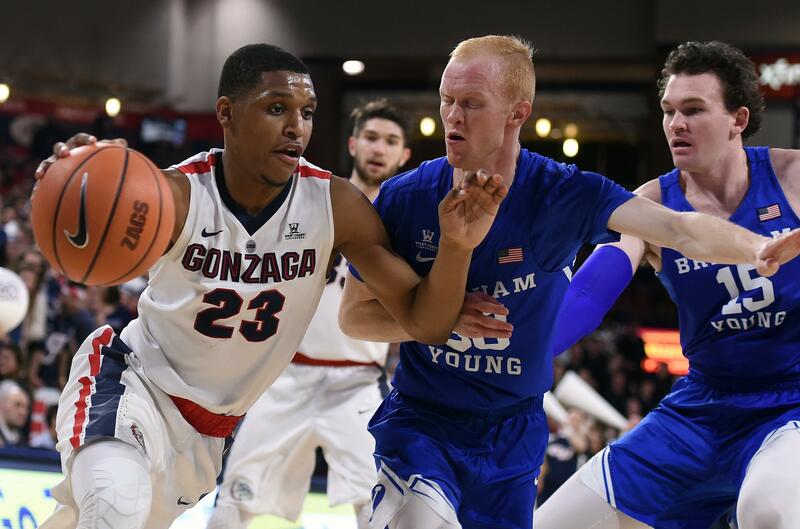 UPDATED: Sun., Feb. 4, 2018, 6:45 p.m.
Gonzaga guard Zach Norvell Jr.’s Saturday night wasn’t going as planned. He missed his first seven shots, including five from beyond the 3-point arc. There was no reprieve for Norvell at the defensive end as a couple of critical lapses contributed to BYU’s second-half comeback. So guess who made the biggest offensive and defensive plays in the final minutes of the Zags’ gritty 68-60 victory? That would be Norvell, the redshirt freshman from Chicago whose confidence runs deep enough to override his short-term memory. Tied at 59, Norvell took a pass from Josh Perkins near the top of the key, faced-up and buried a 3-pointer over 6-foot-5 Cougars wing Elijah Bryant with 2:19 remaining. The triple came shortly after BYU’s TJ Haws hung a three-point play and a 3-pointer on Norvell. Nearly as big was Norvell poking the ball loose from Haws in the final minute with Gonzaga protecting a 64-60 lead. Rui Hachimura’s two free throws sealed the victory. “He’s got an amazing … ,” began coach Mark Few, who concluded the sentence with “very short memory, which for us is probably a really good thing. He was not very good for stretches of that game, even though he had some nice drives. Norvell has built up trust from the coaching staff in part because he’s tough-minded and he’s hit more high-pressure shots than anyone else on the team. Gonzaga was hanging on to a 58-54 lead over San Diego on Thursday when Norvell grabbed a defensive rebound, dribbled down the court and canned a 25-footer with 24 seconds left on the shot clock and 3:10 on the game clock. Norvell tacked on another dagger 3 to close out the Toreros with 37 seconds left. Published: Feb. 4, 2018, 2:26 p.m. Updated: Feb. 4, 2018, 6:45 p.m. Tags: BYU, college basketball, Gonzaga basketball, Gonzaga Bulldogs, ncaa, San Diego, WCC, Zach Norvell Jr.